From a gardening perspective, perhaps the best thing that can be said about February is that it is the shortest month of the year. Winter doldrums reach their peak at this time of the year, as people anxiously await spring. This annual malady can be eased somewhat by making plans for the upcoming growing season. Reviewing the new releases of flowering annuals and perennials is both therapeutic and motivational. Following is a description of a number of the new bedding plants for 2019 that, in most cases, should perform well in Missouri. Ageratum Blue Planet (Ageratum houstonianum). This new ageratum boasts long-lasting blooms resembling tiny blue explosions. It is out of this world in gardens or containers, especially when planted in mass. This tall ageratum branches without pinching and flowers prolifically. It combines well with white flowers in beds or borders. (Botanical Interests, Inc.). Ammi Dara (Daucus carota). A close relative of carrot, this new introduction bears lacy, delicate blooms in shades of elegant blush to deep burgundy, depending on when it is harvested. Its tall, sturdy stems make it a fantastic cut flower. Dara adds a soft, airy, elegance to the garden and fresh or dried flower arrangements. It' is low-maintenance and not aggressive. Fairly drought tolerant once established, it is attractive to beneficial insects. (Botanical Interests, Inc.). Balloon flower Pop Star™ (Platycodon grandifloras). Youngsters may not remember "Platycodon", but they will remember the name Pop Star because the balloon-like flower buds "pop" into beautiful star shaped flowers. A hardy perennial, this platycodon is earlier, more compact and better branching than others on the market. The result is more huge flowers. The series is available in three colors: pink, white, and blue. (Ernst Benary of America). Begonia 'Canary Wings' (Begonia x hybrida). Canary Wings offers a unique take on Dragon Wing begonia which is a staple in gardens around the world. It has bright chartreuse foliage with beautiful red blooms that are produced all season long. It performs best in moderate shade and makes great baskets, pots and combinations. (Ball Ingenuity). Begonia Funky™ Orange (Begonia x hybrida). Slightly unconventional or just plain "cool", Funky Orange's flowers look somewhat like shredded Nonstop™ begonia flowers. Their intense deep orange color and novel flower form are sure to grab attention in the garden. Additionally, they are relatively easy to grow. Funky Orange is perfect for hanging baskets or in mixed containers. (Ernst Benary of America). Begonia Viking™ XL Red on Chocolate F1 (Begonia x hybrida). A 2019 AAS winner, this brand new wax begonia boasts large, uniquely colored dark leaves. AAS program judges were impressed with how the deep bronze/brown color remained sharp and intense throughout the season, no matter where they were located: north, south, east or west. (Sakata Seed America). Calibrachoa Cabrio™ Amethyst; Cabrio™ Eclipse Lilac (Calibrachoa hybrida). The Cabrio™ series of calibrachoa is noted for its uniform habit that combines well together for impactful, multi-color combinations. All varieties have consistent flowering for a wave of color in the garden. Amethyst and Eclipse Lilac are new to the series for 2019. (Syngenta Seeds, Inc.). Calibrachoa Lia Yellow (Calibrachoa hybrida). The popularity of "callies" continues to increase as new varieties are released. 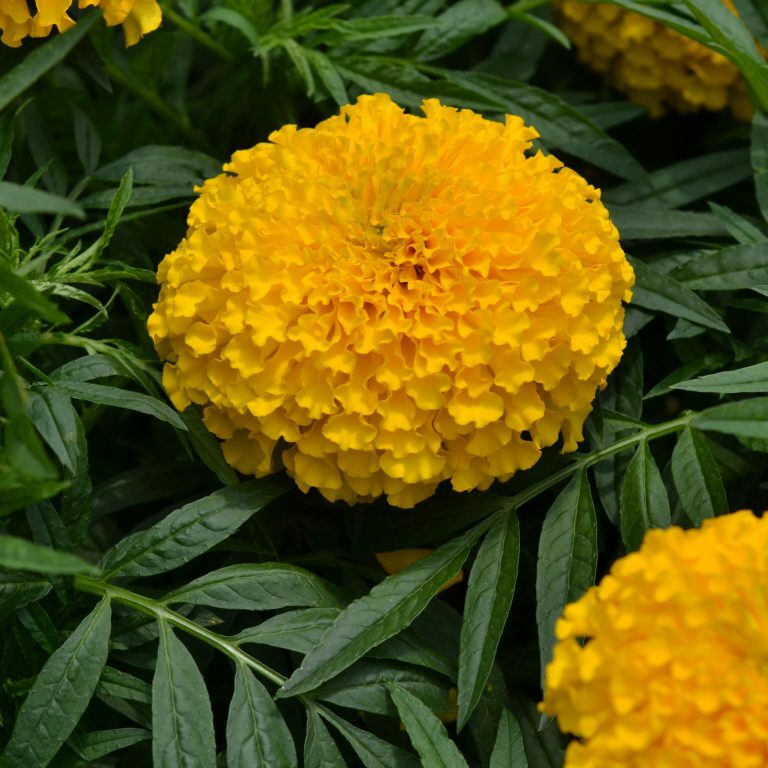 Lia Yellow displays medium vigor and is best-suited for baskets or containers. Less sensitive to pH than other calibrachoa, Lia Yellow has tight internodes for more flowers and great garden performance. (Danziger "Dan" Flower Farm). Calibrachoa MiniFamous® Uno Double Pinktastic (Calibrachoa hybrida). Double Pinktastic is a Fleuroselect Gold Medal winner. Gardeners will love its heavily contrasted double flowers and ball-shaped habit. Watch it trail out of containers and baskets with a youthful pink color and darker double-eye. Calibrachoa attracts bees and butterflies, and are generally low-maintenance options for exceptional color on the patio. (Selecta One). Canna Cabana Canna™ Lemon & Gin™ (Canna flaccida x ppaf). The Cabana cannas bring repeat blooms on compact plants to the home landscape. Lemon & Gin boasts colorful yellow flowers with dark yellow speckles from early summer until frost. The flowers contrast dramatically against lush green foliage. Cannas are not often grown for their flowers, however, this new introduction might change that. (J. Berry Nursery). Coneflower Sombrero® Tres Amigos (Echinacea hybrida). The Sombrero® series of Echinacea is renowned for its hardy, compact plants and flowers of vibrant color. Tres Amigos represents an exciting new introduction that shows three colors at once. Flowers open to peachy-coral, mature to rose and then fade to burgundy. Sombrero® is a highly floriferous series matched only by its exceptional winter hardiness (Zone 4) and excellent branching. (Darwin Perennials). Dahlia Bacardi (Dahlia x hybrida). All dahlias are great for bouquets, but this one is a favorite because it mixes so beautifully with other colors. The two-tone flowers have deep burgundy centers with petals that fade to coral and rose. Blossoms are 5 to 6 inches across and have nice long stems. (Longfield Gardens LLC). Dahlia Belle of Barmera (Dahlia x hybrida). This dahlia bears flowers that are a blend of warm, sunset hues that run from apricot and coral to raspberry and rose pink. Loosely rolled and twisting petals give the impressive 8 to 9 inch flowers extra texture and movement. Plants are tall with attractive, dark stems. (Longfield Gardens LLC). Dahlia Felida Solar Flare (Dahlia x hybrida). Coral is the color that best describes this radiant, semi-cactus flowered dahlia. Its color can be described as warmer than pink but softer than orange, with a lemon yellow center. The 6 to 8 inch blossoms have loosely rolled petals with forked tips. It is beautiful when combined with oranges and reds. (Longfield Gardens LLC). Dahlia Great Silence (Dahlia x hybrida). From a distance, the pretty, two-tone flowers of Great Silence appear to be peach. However, up close they are a combination of rose-pink and gold. Different and surprisingly beautiful, they combine well with purple, orange, yellow and burgundy. The 4 to 5 inch flowers are borne on dark, slender stems. (Longfield Gardens LLC). Dahlia Karma Gold (Dahlia x hybrida). Karma Gold boasts warm, golden yellow flowers 6 inches in diameter with butterscotch centers. Its dark, strong stems and healthy green foliage make it an ideal candidate for the cut flower garden. (Brent & Becky's Bulbs). Dahlia LaBella Medio Purple Fun (Dahlia pinnata). LaBella Medio Purple Fun bears purple flowers with a yellow center. Attractively located between the two is a layer of white petals, making for a very unique look. Short in stature, it is ideal for 4 to 6 inch pot production, or it can be used in beds. This is a very eye-catching new border dahlia. (Beekenkamp Plants). Dahlia Lake Michigan (Dahlia x hybrida). This new dahlia is as exquisite as hand-painted porcelain. Each creamy white petal is adorned with delicate brushstrokes of violet-pink. A primrose yellow center makes the 5 inch blossoms seem to glow. Ideal for the cut flower garden, Lake Michigan will add a fresh look to summer bouquets and give months of flowers, starting in July and continuing through September. (Longfield Gardens LLC). Dianthus Corona® (Dianthus chinensis). The Corona series boasts the biggest blooms of any dianthus of this type. Corona features exceptional flower form and a palette of show-stopping colors, making it a great choice for cool-season landscapes, gardens and patio planters. Available in four colors: Cherry Red, Strawberry, White, and Rose. (PanAmerican Seed). Geranium Calliope® Large Dark Red; Calliope® Large Hot Rose; Calliope® Medium Light Lavender and Calliope® Rose Mega-Splash (Pelargonium interspecific). An interspecific cross, the Calliope series is an industry first in innovation and considered by many to be the number one geranium for both vivid flower color and plant performance. Its vigorous growth habit make it ideal for high impact containers were flower power and "wow" factors are desired. Four new colors were added to the Calliope series for 2019 (Syngenta Seeds, Inc.). Geranium Pretty Little™ Pink Splash (Pelargonium interspecific). This new hybrid boasts loads of small, bi-colored flowers that provide incredible garden impact. Pretty Little Pink Splash's interspecific ancestry provides increased branching, color-saturated flowers and superior garden performance. (Syngenta Seeds, Inc.). Impatiens SunPatiens® Compact Pink Candy (Inpatiens x hybrida). The SunPatiens® series of impatiens delivers outstanding garden performance. Bred for a mounding, spreading growth habit, SunPatiens offer three-season flower power. These remarkable plants represent a breeding breakthrough resulting in vigorous, heat-tolerant plants that thrive in full sun or part shad exposures. SunPatiens are an excellent alternative to seed impatiens and offer downy mildew resistance. Compact Pink Candy is new to the series for 2019. (Sakata Seed America). Lavender Blue Spear (Lavandula angustifolia). Blue Spear is considered by many to be the showiest English lavender available. It boasts bigger and taller spikes than other seed-propagated lavender, with more tightly-packed, upright flower stems for huge impact from a distance. Easy to grow, it maintains a tidy habit in the garden. Blue Spear attracts bees and butterflies, while resisting deer and rabbits. Plants are drought tolerant and very fragrant. (Kieft Seed). Nasturtium Baby Rose (Tropaeolum minus). A 2019 AAS winner, Baby Rose is a petite-flowered, mounding nasturtium with healthy, dark foliage and is ideal for containers and small space gardens. Its compact habit means less "flower flopping" with blooms remaining upright throughout the season. The rose color of this 2019 introduction is rare in nasturtiums, and contrasts beautifully with its dark-green foliage. (Takii Europe BV). Painted Tongue Gloomy Rival (Salpiglossis sinuate). Salpiglossis (painted tongue) was introduced as an ornamental plant from Chile, and its country of origin gives a hint as to its culture. Sunny, dry days and summer nights that cool down are the ideal. Yet, with a bit of attention, it can be a star in Midwestern summer gardens This selection features velvet petals of ghost blue with dramatic veining that make excellent, long-lasting flowers. (Select Seeds, Co.). Pansy F1 Cello Raspberry Surprise (Viola x wittrockiana). The Cello series of pansy is noted for its sturdy plants that display good basal branching. Raspberry Surprise produces flowers in shades of rose, pink, gold and lavender with white and a dark blotch face. It is very attractive for spring or fall beds and when used in mixed containers. (Hem Genetics BV). Pansy F1 Xtrada™ Pink Shades with Blotch (Viola x wittrockiana). The Xtrada pansy series combines compact growth habit along with very large flowers on plants that show good heat and cold tolerance. Pink Shades' flowers are deep pink with a dark blotch face. It would make a beautiful addition to the spring of fall garden, or in mixed containers. (Hem Genetics BV). Petunia Easy Wave® Violet Improved (Petunia x hybrida). Easy Wave Violet received an "extreme makeover" for 2019. Always a standout in the petunia garden, this improvement results in less upright vigor and shorter peduncles for improved performance more in line with the Easy Wave series. Its deeper color and sturdier flowers make for a less floppy appearance. It's a great choice for beds, baskets, mixed containers and more. (PanAmerican Seed). Petunia SuperCal® Premium Sunray Pink (Petunia x hybrida). A cross between petunia and calibrachoa, the SuperCal Premium series boasts exceptional garden performance under all kinds of weather. Withstanding both cold and heat, SuperCals "bounce" back even after driving rains. Sunray Pink is self-cleaning and looks beautiful spring through fall. (Sakata Seed America). Petunia Supertunia Vista® Paradise (Petunia x hybrida). Supertunia Vista petunias are renowned for their vigorous, mounding growth habit that can reach up to 2 feet in height in the landscape and will trail over the edges of baskets and containers. They are fantastic both as landscape or large containers plants functioning as fillers and spillers. Vista Paradise bears watermelon-pink flowers that literally hide it foliage. (Proven Winners North America LLC). Petunia Wave® Carmine Velour F1 (Petunia x hybrida). 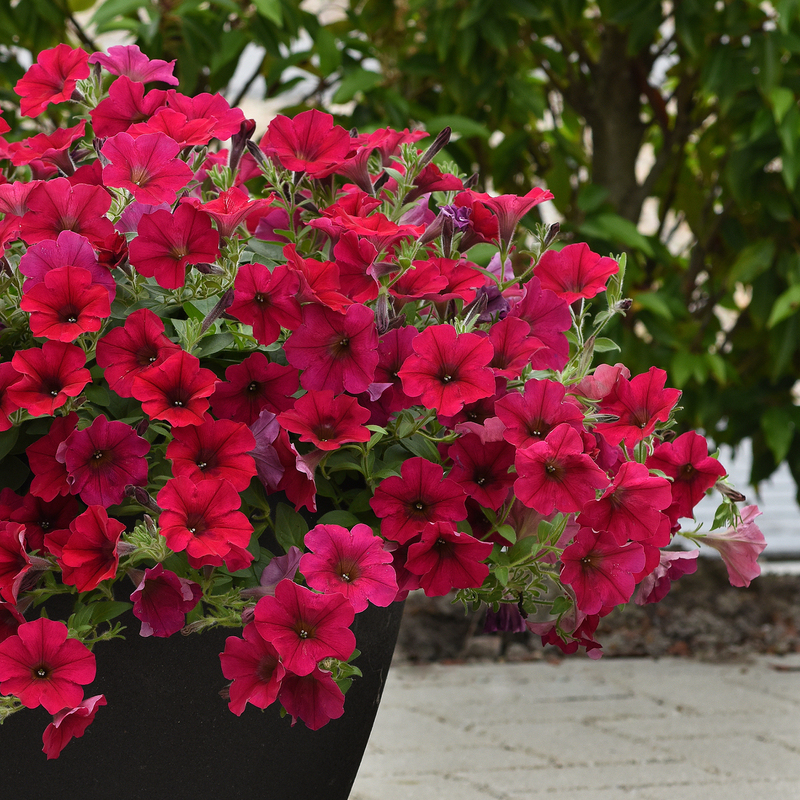 A 2019 AAS winner, this newest color of the popular Wave petunias evokes adjectives like fabulous, stunning and vibrant. It is sure to become a garden favorite. Its large 2 to 2.5 inch flowers literally cover its spreading, easy-care plants that continuously produce new bloom thus eliminating the need for dead-heading. Wave petunias are excellent landscape performers and do equally well in containers, hanging baskets or planted in the landscape in beds or borders. (PanAmerican Seed). Salvia Skyscraper™ (Salvia cultivars). The Skyscraper series of salvia are tender perennials that bloom from late-spring through fall. They feature large, long-lasting blooms and with better branching plants when compared with seed-propagated salvia. Have sturdy stems, Skycraper offers a tall show in the landscape. Attractive to bees, butterflies, and hummingbirds plants are drought and heat tolerant. Available colors include orange, dark purple and pink. (Selecta One). Scabiosa 'Midget Mauves' Macedonian (Knautia macedonica). Midget Mauves produces compact plants about 16 inches tall. Its widely branching flowering stems are topped with dozens of lavender-amethyst flowers that sparkle from June through October. Knautia grows well in average soils in sun or partial shade. The pincushion family of plants is known for their harmonious relationship with butterflies and other pollinators. (Jelitto Perennial Seeds). Sunflower Chocolate Cherry (Helianthus annuus). Chocolate Cherry makes a striking appearance in the garden with its burgundy petals and dark chocolate center. The flowers are 5 inches across and borne on plants that reach 6 feet in height. Chocolate Cherry also does well as a cut flower and has excellent vase life. (Seeds by Design Inc.). Sunflower ProCut White Lite (Helianthus annuus). This new introduction boasts gorgeous clean white petals that surround a light yellow disk, making for a dramatic new sunflower color combination. Its 5 to 6 inch diameter flower are borne on plants 5 feet tall. Like other sunflowers it is heat tolerant, easy to grow and is excellent as a cut flower. (Harris Seeds & GardenTrends). Tickseed 'Electric Sunshine' (Coreopsis hybrida). Electric Sunshine is a beautiful new coreopsis that is a stunner in the garden. It flowers wonderfully from spring until late-fall, providing a non-stop display of bright color. Allow plenty of space for it to achieve its full glory. Use as a tender perennial in the South and an annual in the North. It attracts bees and butterflies, while being heat tolerant and low-maintenance. (Darwin Perennials). Verbena Firehouse™ (Verbena peruviana). The new Firehouse series of verbena blooms well into the summer and won't cycle out of color in the garden. It is ideal for baskets and mixed containers because of it medium-mounded growth habit. Firehouse is available in nine colors with garden performance in the heat equal to that of the EnduraScape™ series. (Ball FloraPlant). Vinca SOIREE KAWAII® White Peppermint (Catharanthus hybrid). The Soiree Kawaii series are micro-blooming Catharanthus which light up any garden with their amazing flower coverage, vivid eye-drawing colors with deep glossy green foliage. Maintaining its habit all summer long, it has no leggy branches and has tons of flower power. (Suntory Flowers Limited). Vinca Tattoo™ (Catharanthus roseus). The art of plants comes alive on every Tattoo bloom. Each petal looks "inked" with soft brush strokes of black, causing them to stand out in the garden or in containers. This new vinca series is bold, fun and head-turning. An outstanding performer in hot and sunny conditions, Tattoo is available in four colors: Papaya, Tangerine, Black Cherry, and Raspberry. (PanAmerican Seed). Zinnia Profusion Lemon (Zinnia elegans). Profusion series zinnias are practically "bullet proof" in the garden. They are extremely disease, heat and drought resistant. All Profusion zinnias (offered in 10 colors) are easy to grow and offer extended flowering in the garden. Profusion Orange, White, Red and Cherry were AAS winners when introduced. Profusion Lemon adds an exciting new color to the series. (Sakata Seed America). Zinnia Zinderella Mix (Zinnia elegans). Scabiosa-type zinnias are a novelty, with their many layers of petals creating a full, tufted appearance. Consider this type for added texture and unique garden accents. In short, Zinderellas are real eye catchers. The mix includes lilac, purple, and white colored zinnias. (Harris Seeds & GardenTrends).